All right, guys….here it is. 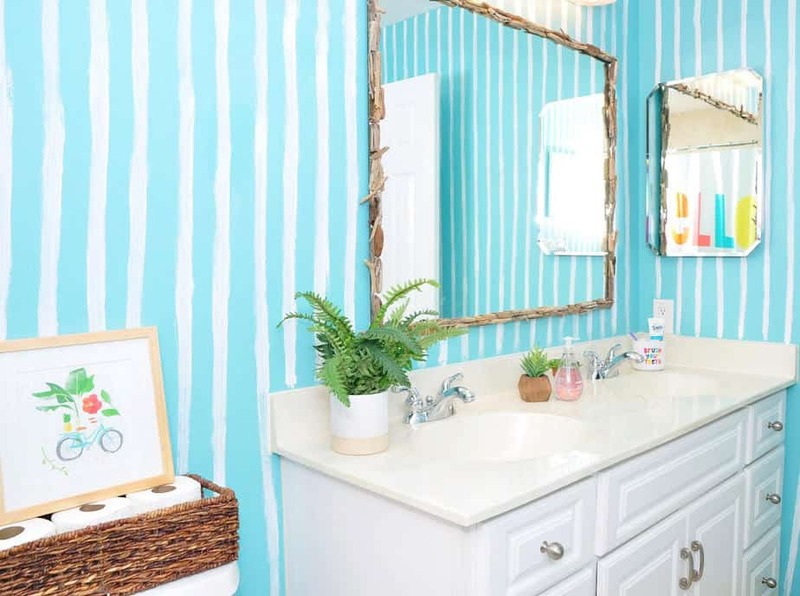 The big reveal of the kids’ shared bathroom makeover! 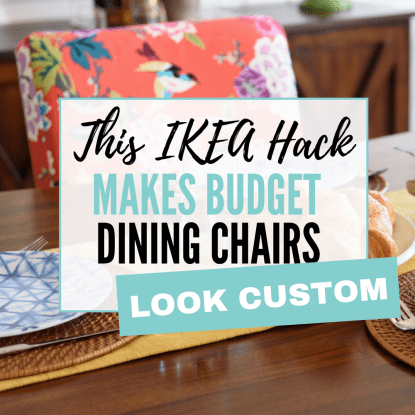 In case you’re new here, the $100 Room Challenge is the brainchild of my friend Erin at Lemons, Lavender and Laundry — the goal of the challenge is to show that it IS possible to give a space in your home a refresh on a budget. In this case, I had a total of — spoiler alert — $100 to spend on the project. (Shocking, right, given the name of the challenge?). 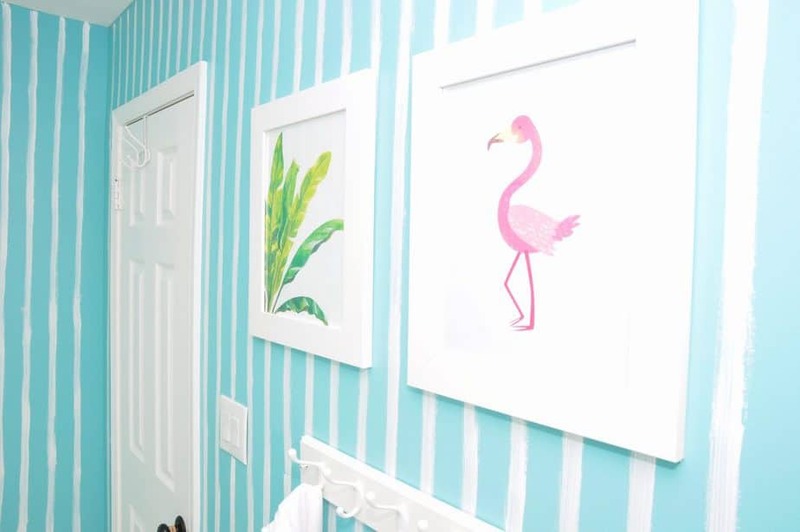 I decided to give my son and daughter’s shared bathroom a bright and beachy makeover. The bathroom was fine, but certainly nothing special. 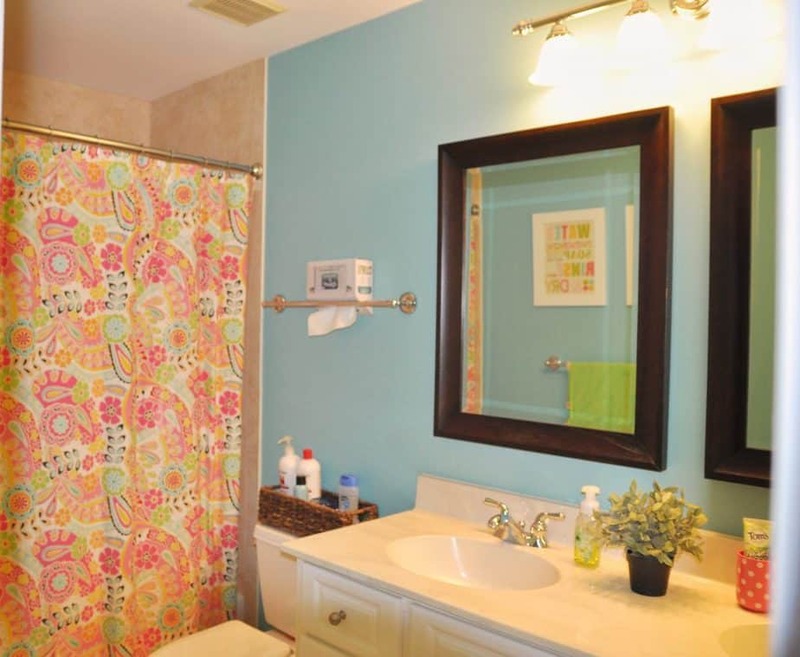 When we moved into our current home a few years ago, the walls were already this color, so we basically hung up our shower curtain, tossed an IKEA faux plant on the counter, and that was that. Overall, the space feels much brighter and a whole lot more fun. 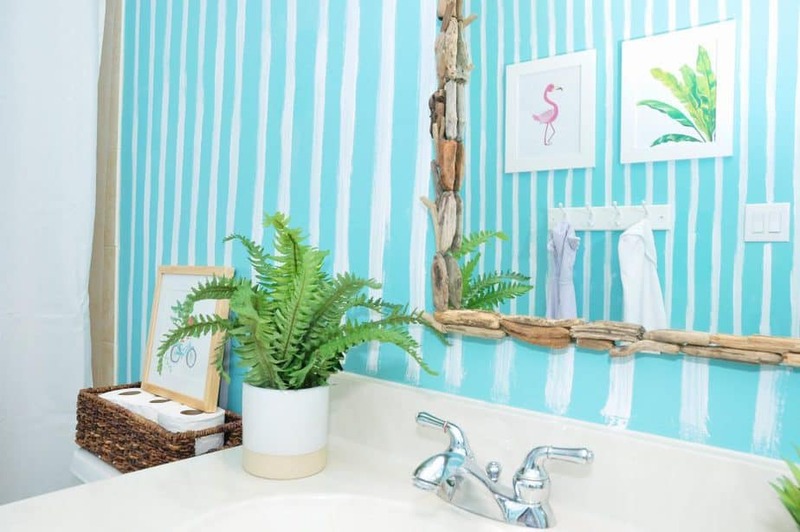 That driftwood mirror was a game changer, and it cost me — wait for it — $40! I scored a free mirror from a neighbor, and ordered a box of driftwood on Etsy. Then I grabbed my hot glue gun and went to work. The tropical botanical print was a FREE download, and I made the flamingo print for $1. Can’t beat that! So, I’ll consider that a win. Now, let’s break down the budget and talk about exactly what I spent. All of this came to a grand total of…..$84.92! 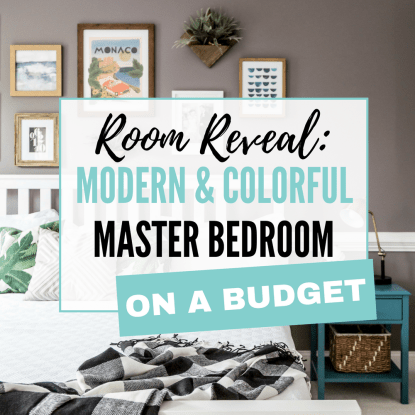 Although I’m really happy with where this room makeover landed, I always have ideas up my sleeve, so it’s highly possible I’ll make some additional changes to the bathroom beyond what I tackled for the $100 Room Challenge. Purchase some simple white wall shelves to hang above the toilet. 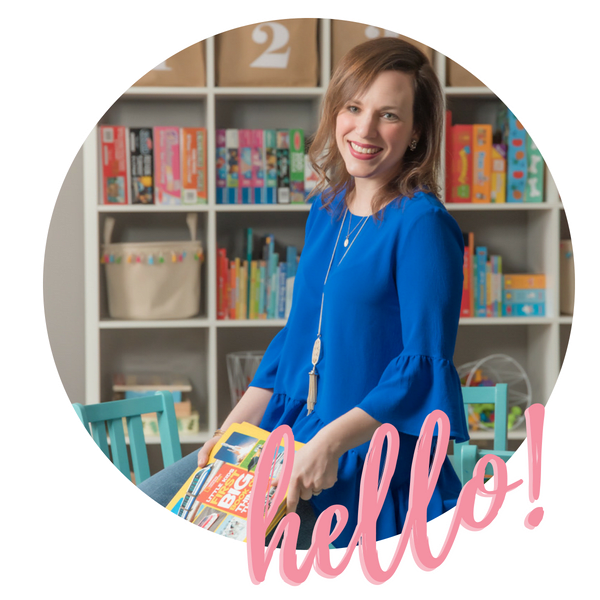 That was always part of my plan, but the truth is that I was working on everything else right down to the very last minute, so running to Target for wall shelves just wasn’t happening. But no biggie. That’s an easy upgrade I can make at a later date. That poor little watercolor bicycle print needs a home that is NOT on top of the extra toilet paper…..
Swap out the light fixture. It’s just so….builder basic. Meh. I’m not sure what I want to replace it with, but I bet I could find one on sale at Home Depot that is waaaaay better. Change the vanity hardware. Similar to the light fixture, the vanity hardware — which has some sort of weird scrolly design on it — isn’t my cup of tea. (And yes, “weird scrolly design” is totally interior design speak, in case you were wondering.) The current hardware is also brushed nickel, yet the light fixture and shower curtain rod are polished nickel. Mismatched finishes, unless one has painstakingly gone 50/50 on two different finishes, is one of my biggest pet peeves. There, I said it. Of course, one of these days I’d love to gut this bathroom and give it a full-fledged makeover. 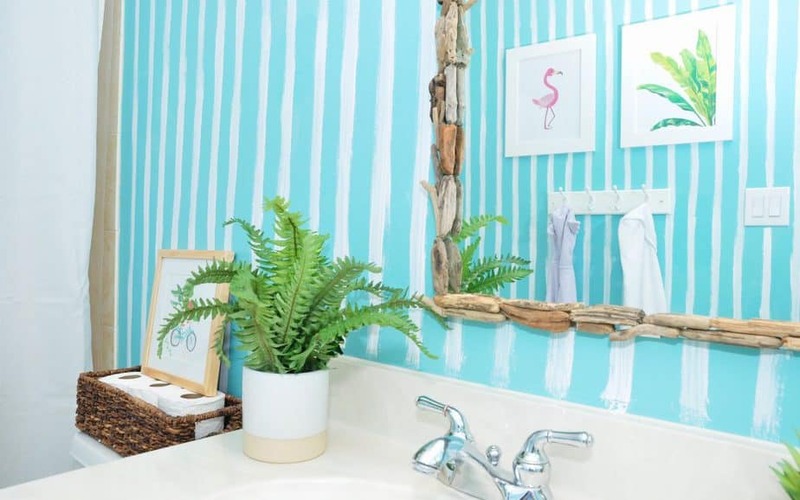 But I’m pretty sure that’s going to cost me far more than $84, so for now our beachy and bright bathroom will have to do! What do you guys think? Are there any projects I tackled as part of this challenge that you’d consider taking on in your own home? What a transformation, Kate! 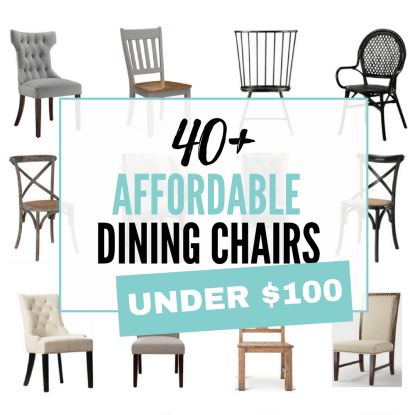 I can’t believe you did it all for under $100! 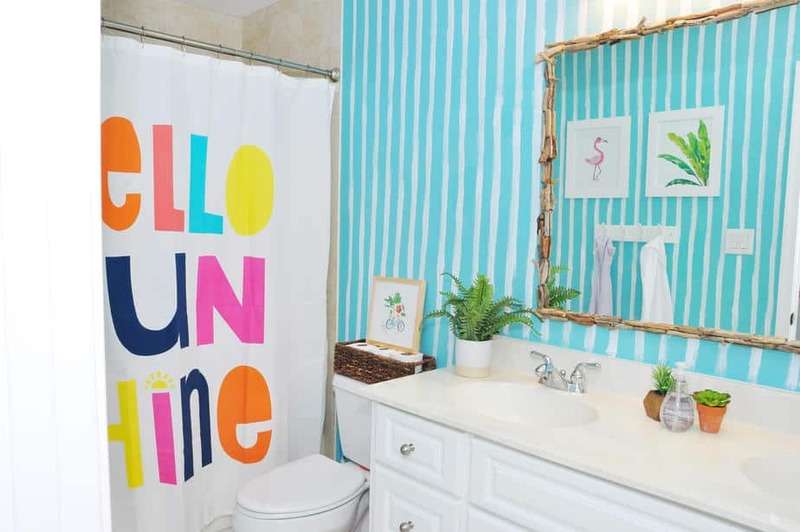 I love everything about the space, especially the stripes and fun shower curtain! Thank you so much, Elizabeth! 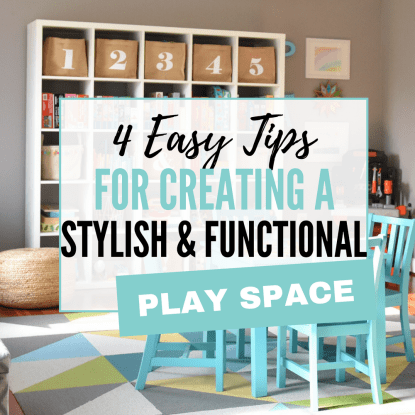 I was fortunate in that I had a lot of decorative accents on hand already, so I didn’t have to blow my budget on accessories (they get me every time!). Wow, it really does look amazing! The stripes are so fun, as are the accessories. And I love your driftwood mirror! So simple, yet so perfect. It looks like a whole different room! This is the happiest bathroom ever! The prints you put up are too cute. I love the flamingo! Thank you, Liz! Using Canva to make that flamingo print was the easiest DIY ever. 🙂 Love when DIY projects turn out well AND they’re budget-friendly! Your daughter is right, this bathroom is amazing! I’m so glad you were able to figure out how to DIY the mirror that you wanted, and I hear ya on having more on the “to do” list. I have a couple things I’d love to finish up in the living room, but it sure looks better than it did a few weeks ago. Way to stay under budget (enjoy those new shoes 🙂 ). And thank you for joining the challenge this month!!! It’s so bright and welcoming now!! Thanks, Ashley! It’s definitely putting out some bright and beachy vibes, so my daughter is basically on cloud nine…..
Oh wow! What a bold and pretty transformation, you did a great job! Oh wow I love it! Anything beachy is awesome and you rocked it! I especially loved the driftwood mirror! I love how it turned out! Those stripes ended up being fantastic! 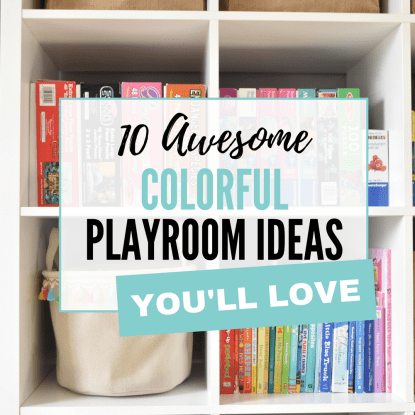 What a fun space! No reason/excuse for grumpy kiddos in the morning- this should get them started with a happy attitude for sure! This is just too fun!! I love the bright colors and the good vibes it gives. That shower curtain is my fav! Thank you for the kind words, Jessica! 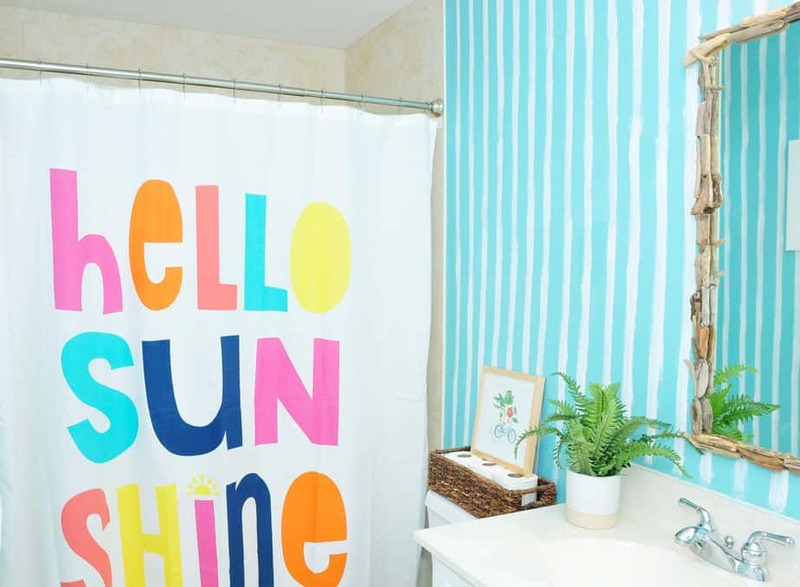 That shower curtain was such a steal, too….love those kinds of finds! Adorable!!!! It’s so bright and fun!!! So colorful and bright. Love those prints! Thanks so much, Kathryn! The prints are one of my favorite parts of the room, for sure. WOWWWWW that is so stunning! definitely my goal in the future! Thanks! My daughter is a big fan of bright colors and LIVES for beach trips, so this bathroom makeover was right up her alley. The shower curtain is wonderful! I love how the bathroom turned out.